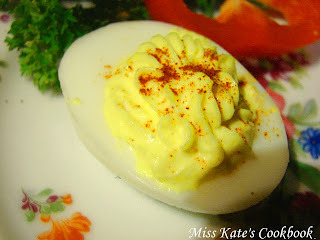 This is a good twist on Devil Eggs. 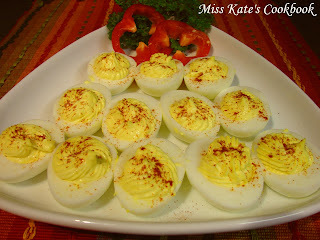 I call them adult Devil Eggs. 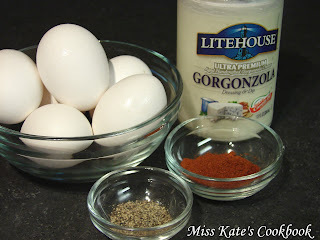 You can do these two ways, by using Gorgonzola dressing or by using Blue Cheese dressing. My grandmother use to have tea parties for her Bridge Club, she would serve tomato sandwiches, her devil eggs, sweet tea, and teacakes. I remember that she would leave some in the kitchen for me. I think you will really enjoy these and you do not have to wait until summer, they are nice any night of the week. Enjoy! Put eggs in a small pot and cover with water. Cook on high until water boils, reduce heat and cook for 7 to 10 minutes. The secret to not tearing the eggs apart is put the pot in sink and start running cold water of the eggs. Now, tap the bottom of the egg and start slowly pulling the shell. Wait 10 minutes till eggs have totally cooled, then you can cut them in half. Place the egg white halves in the refrigerator until they are cold. Now, take the yolks and place them in a bowl. In the bowl of yolks 1/3 of a cup of the Gorgonzola dressing, pepper, and Tabasco and mix well. Check the consistency if the mixture is really thick add more dressing. If it get to thin you can add potato flakes. Place in refrigerator till cold. Now, your ready to place mixer into the eggs. Your can spoon them into it, or you can use a icing bag with a large tip. Sprinkle with paprika.